Liverpool have scored 1,000 Premier League goals at Anfield — now we bring you the definitive World Cup-style vote to find out exactly which is the best of all! The Reds are no strangers to phenomenal goalscoring exploits and this season is highlighting the fact once more. Nailing down the best, from all the goals the famous old ground has seen in the Premier League era, is a difficult task—but that’s exactly what we’ve set out to do, with help from you: the readers. This Is Anfield are conducting a World Cup of Liverpool’s home Premier League goals, with fans voting on social media to determine which progress and, ultimately, which single strike is crowned one-in-a-thousand. Here below you can find the final 32 candidates, split into groups of four; you can watch each of the goals by clicking the link on “vs.” in each case. We’ll be holding Twitter polls — make sure you’re following @thisisanfield to take part! — on each group to find out exactly who progresses to the knock-out stage, two from each group, from Wednesday afternoon. There will then be round of 16 match-ups on Friday, quarters and semis on Saturday and the final itself on Sunday. As the group name suggests, here we’ve a quartet of goals with an absolutely top-drawer touch and the perfect angle of execution. Fowler’s goal was the second in an early blitz to see off Villa, with the Reds going three up inside the opening 10 minutes. The No. 9 produced a great turn past ex-Red Steve Staunton, then rifled one in the far corner from range. 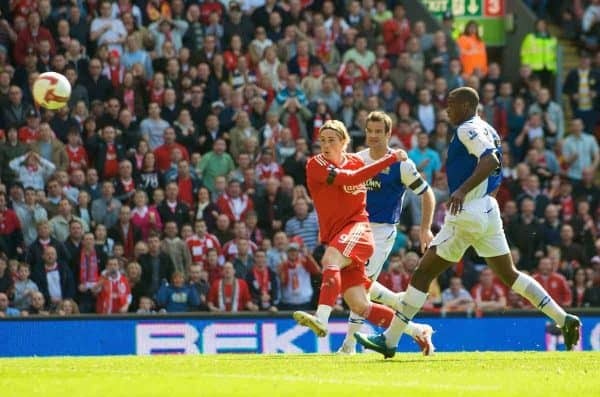 Torres linked brilliantly with Gerrard, who sent a through pass toward the striker, and his absurd body swerve—without touching the ball—fooled the keeper and allowed the Spaniard a cool finish. Czech midfielder Berger absolutely loved a goal against Chelsea—and this was his first of three on the day, a gorgeous dinked lob. And Crouch’s contribution was an outstandingly executed overhead kick, perfectly meeting a cross from the right. Everyone loves a goal rattled in from range. Except the goalkeeper, of course. These four were utterly unstoppable. 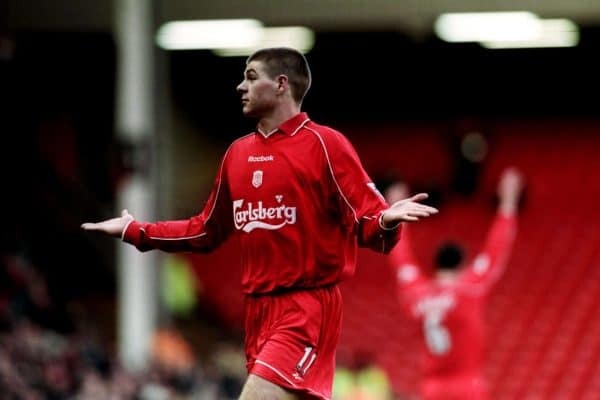 Gerrard’s name is a recurring theme, unsurprisingly, given he scored some belters—and one against Saints in his early years typified his game at the time. He was miles out, almost facing 90 degrees away from goal, yet lashed one in off the bar. Rumour has it that the ball used for Riise’s iconic free-kick against Man United is still orbinting the earth, having ripped through the net, punched a hole in the stands and flown into space, such was the ferocity he hit it with. Last minute, drawing a match against a rival, in front of the Kop—and belting in a winning goal. What a moment for then-young striker Neil Mellor. And a lesser-spotted name on the scoresheet, but Hamann’s rocket of a volley against Portsmouth would have been heralded by all had it been smashed in by an attacking midfielder of repute. While the last four were scorchers, this quartet adds unbelievable vision and self-belief to the distance. Gerrard dragged the Reds back into matches by himself at times and that was definitely the case here, powering in a swerving, looping volley from around 40 yards out. Alonso scored successive goals from inside his own half; one came in the FA Cup and he followed it up with this one against Newcastle in the league at Anfield. 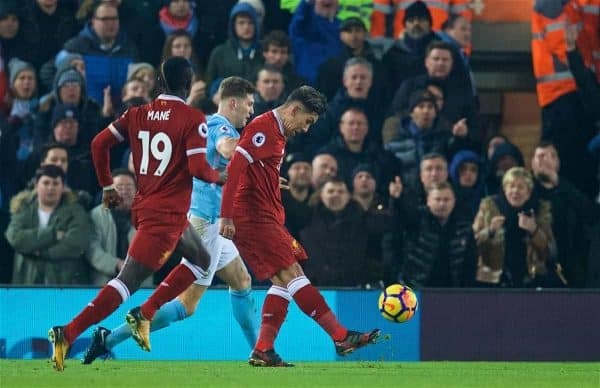 Coutinho had a habit of scoring tremendous strikes from range and this one against City was inch-perfect to seal yet another win over them. And, finally, fan favourite Litmanen showed his magical touch and vision to spank home a great effort against Spurs, reminding everyone how he was chronically under-used at the time. Bridging the gap from Groups B to C is this collection, each with their own sprinkling of genius to add to the thunder contained in each player’s boot. Fowler’s first-time, mid-air lay-off was good enough—but then Gerrard’s finish was absurd, drilling in a top-corner strike from distance. Collymore’s debut goal was one to remember, twisting past two defenders and curling a great left-footed effort into the far corner. And marauding forward from defence was a common sight when Agger played, with his lethal hammer-strike—as it were—from range finding the top corner against the Hammers. In that right channel between full-back and centre-back, Liverpool forwards love to lurk. And score incredible goals. A lofted pass from Carragher found Torres, who took the ball beautifully on his chest, measured the bounce…and unleashed hell with his magical right boot. A dipping, soaring half-volley across the face of goal into the far corner. One with his left foot, and all sorts of memorable. Gerrard’s chipped finish here was the first of a derby-day hat-trick, on his 400th game, and ruined David Moyes’ 10-year anniversary. Lovely. Few had a touch-and-finish to rival God, and Fowler showcased as much against United as he held off a challenge as the ball dropped over his shoulder, and spanked it top corner with his left boot. A first goal for the Reds came in spectacular style for Pennant, as the winger allowed the ball to bounce and returned it with interest into the far top corner. The best from the left tends to come just a little further out, in truth. Does that make them more special? Or just a different kind of special? Suarez loved playing Norwich, didn’t he? The goal we’ve picked out was his first of a four-goal haul on this occasion, letting the ball bounce past him and firing a delicious half-volley, from way, way out of the box, over John Ruddy and in. Salah is known for his regular goalscoring, but most come inside the box. This was most certainly not inside the penalty area. Ederson’s clearance found the Egyptian and his control and return-fire were perfect, lobbing the stopper and scoring. 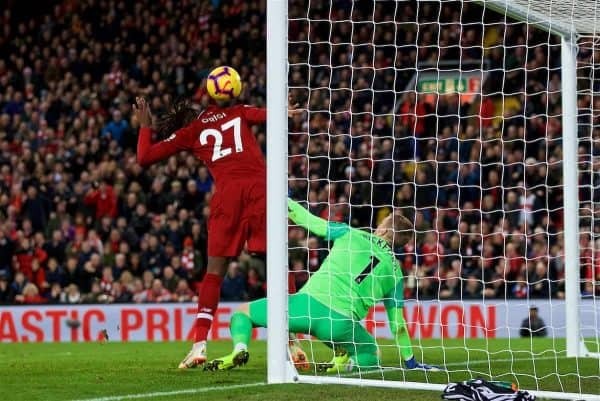 Sturridge’s finest moment, perhaps, as he showed all the pace, poise and technique in his locker with a perfectly placed, chipped finish from range against the Baggies. The current skipper netted one of the goals of his life against City in the same game as Coutinho’s strike from Group C, cutting in onto his right boot from the left and finding top bins on the far side. Brilliant. Not everything has to be laces from 50 yards. These unforgettable moments were the pinnacle of Anfield celebrations for many, many fans. Ninety-six minutes, derby day, Van Dijk’s shot skied, keeper spills it, crossbar bounce, Divock Origi, one yard from goal, super sub, delirium, Klopp on the pitch, madness ensues. A quite incredible match saw the Reds and Magpies go all-out at each other—and then John Barnes teed up Collymore in the final seconds to lash home a winner which remains one of the league’s most iconic moments. 4-3! Earlier we mentioned Coutinho’s curler for a 2-1 win over City; this came a year earlier, smashing in a half-cleared ball from Kompany for a 3-2 win over the same team. The Reds were so close to the title. Smicer didn’t score many, but they were often vital! Chasing the title and against a rival, this volleyed winner came in stoppage time to give the Reds a 1-0 win and send them top in late March. We finish up with another batch of incredible individual moments, with each of these goals showcasing utterly unstoppable footwork en route to the back of the net. When a player can control a ball over the shoulder, hold off a defender, dink it past the keeper and finish for a goal, all within about five metres and two seconds, you know he’s special. Luis Suarez. One Salah, five Spurs defenders? No problem. With no room to move and from a narrow angle, the Egyptian’s footwork and composure was incredible to behold. Firmino showed every facet of his game to help win possession, show great movement, barge off a defender and clip in a beautiful, impudent finish against City. Kuyt scored from about half a yard out, but before it came some of the most wizard-like footwork from Suarez to evade four challengers and beat the keeper. 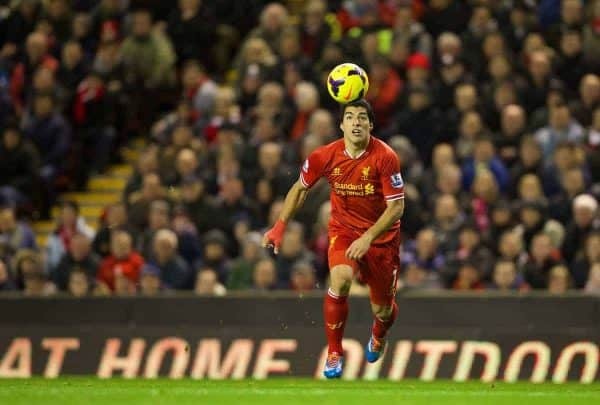 An early sight of his genius at Anfield, and against United to boot. 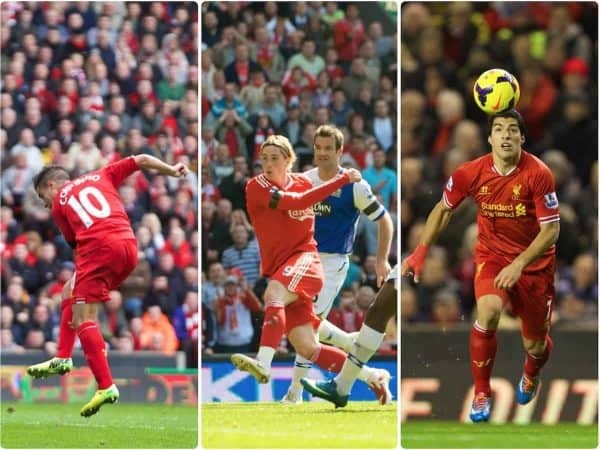 Kuyt went on to net a hat-trick!